Thanks a lot, my dude! Interesting. I like the visual style. 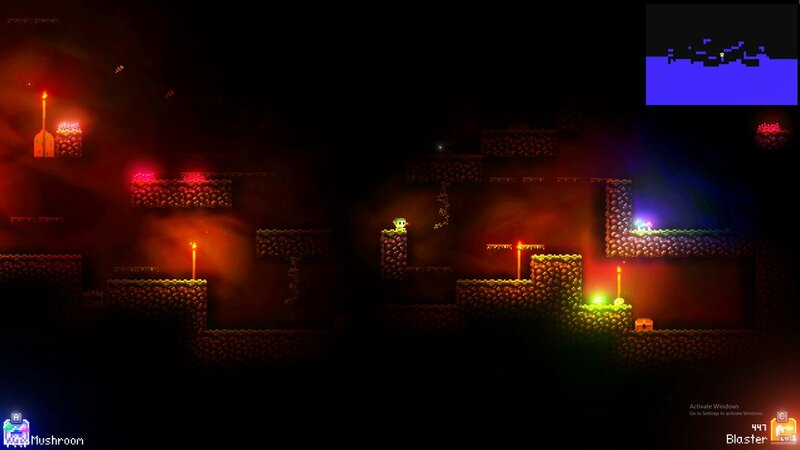 All those glowing colors are truly delightful. However, judging by the gif in the OP, the animation speed appears to be way too high. Especially those climbable vines just move way too fast. Almost like they're dancing or something. I think you should slow them down. The focus should be on the player and his/her movements and when everything is moving like crazy and begging four your attention things just get way too distracting. I was actually thinking of having a music based level, where all the objects bob up and down like this. And certain hazards would be based on the beat of the song. The only problem is syncing audio up with gameplay. And if people have slow computers, things would get really weird. Okay, it's awesome. Any ETA? How long is the game? Fill me in!!! Thanks man! No ETA as of now. Progress is steady, but it's a lot of work! I plan on making the game pretty long. 10 dungeons are planned. You get to the boss of each dungeon on the 10th floor. Nice work, I know a fair bit about planning big - I hope it works out for you! Man, I really want to play this! Just had to take a photo of this. I'm messing with volumetric-ish lighting, and procedural backgrounds. Damn, that looks good. Any videos of this, maybe? Busy working on xcom-like, steampunk/vermintide pixel art strategy game called "This is the End". Thanks guys! I don't have videos of the game yet, just gifs on here and twitter.